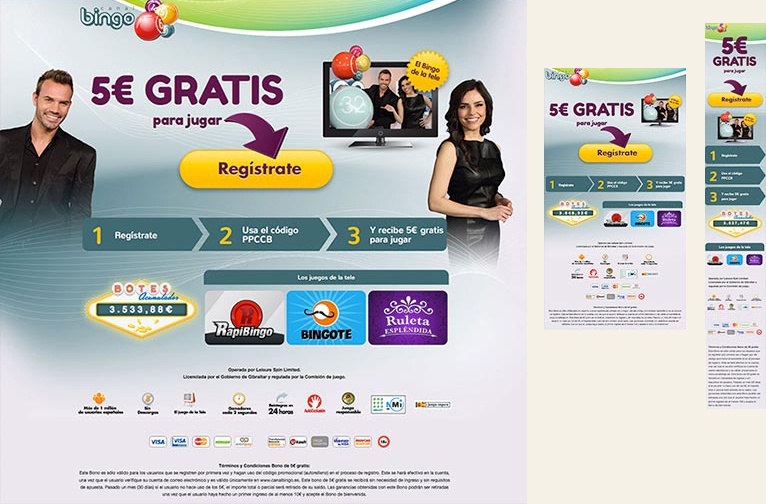 The brief was to creat a responsive landing page for Canal Bingo. It needed to have a big call to action button, 3 steps, logos of some games, a ticker showing the current jackpots and all the legal images with the terms and Conditions. On big screens you can see the background image with people (the tv presenters of the bingo tv program), but for tablets and mobile they were removed in order to get a clearer layout in smaller screens. I used 2 different google fonts. Fredoka One and Nunito. Both san serif fonts.